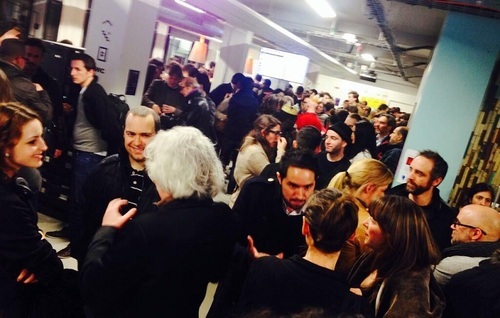 Yesterday, the Parisian Mailjet team attended the first edition of the French Tech Galette which took place at NUMA, one of the biggest co-working places in the world. During this event, we had the opportunity to meet interesting and motivated members of the Parisian tech family and, of course, to enjoy delicious galettes. But… wait a minute… what the hell is galette? French pastries and desserts are well known all around the world, thanks to various people: Marie-Antoinette and brioche, Amélie and crème brûlée, Kanye West and his damncroissant… but galette has not gathered the same international fame as those renowneddelicacies. Galette is a traditional dessert that most of the French people eat during Epiphany, which happen the first week of January. This cake, made of puff pastry filled with almond cream (the frangipane), contains a trinklet, the fève. Whoever gets the fève in their slice of galette becomes king or queen. Mailjet is proud to have sponsored this fun and warm event. The fact that so many people assembled so quickly (it took a week to create and invite this party!) highlights Paris as one of the most active cities in the world to innovate and start tech based companies. At Mailjet, we like to think that we contribute to that entrepreneurship state of mind. French Tech Galette… out of France! You missed this weird in a fun way event? Don’t panic! You’ll be able to catch it up and meet the London based Mailjet team January 22, during the Londoner French Tech Galette! Once again, we’ll eat cake, wear paper crowns and meet great people. So do not hesitate and come to meet us!